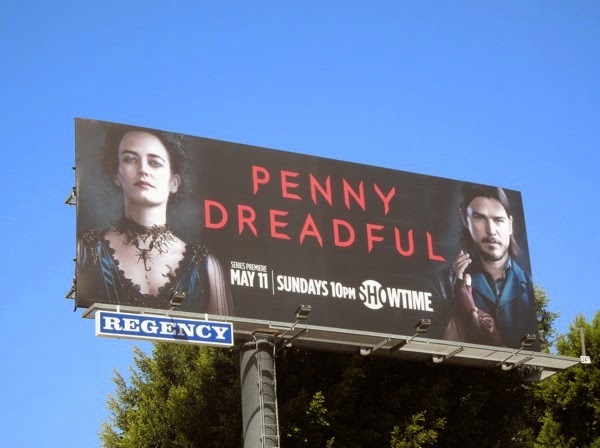 It's been some time since we've seen a strong woman taking on supernatural forces in her own series, so move over Winchester Brothers, as there's a new monster hunter in town, as Eva Green stars as the clairvoyant 'Vanessa Ives' in Penny Dreadful. 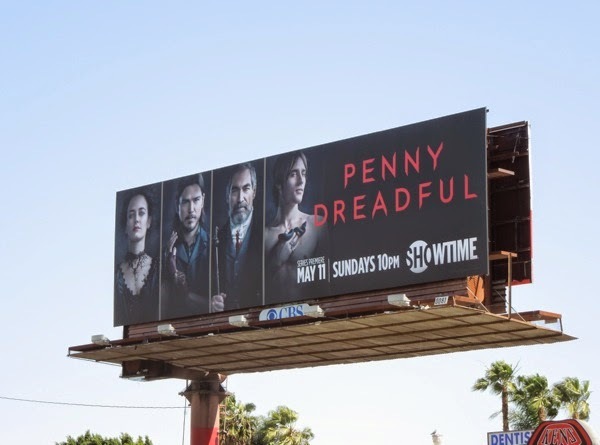 In Showtime's thrilling new drama, she's joined by Josh Hartnett as the sharpshooting man with a past, 'Ethan Chandler', facing some of literature's more fearsome characters like 'Dr. Frankenstein', 'Dorian Gray' and even horrors from the novel Dracula, in the darkest corners of Victorian London. 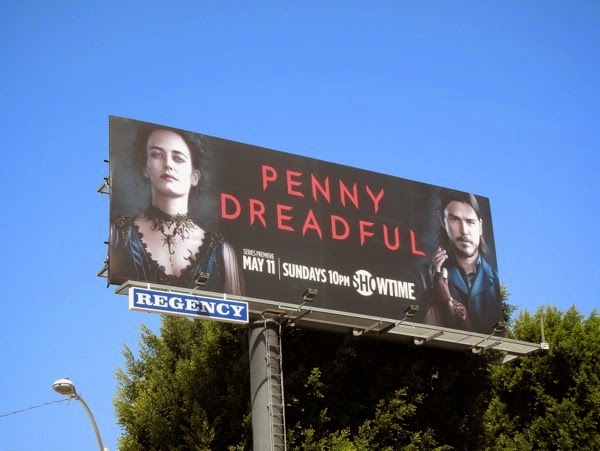 This billboard for the new supernatural chiller was spied along West Hollywood's Sunset Strip on April 14, 2014 and Daily Billboard especially likes the clever scorpion necklace detailing around Eva Green's Victorian gown which hints at dark and deadly forces. What do you think? 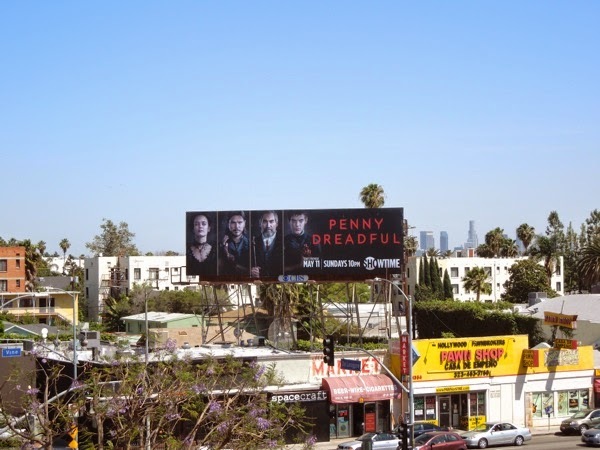 Penny for your thoughts. 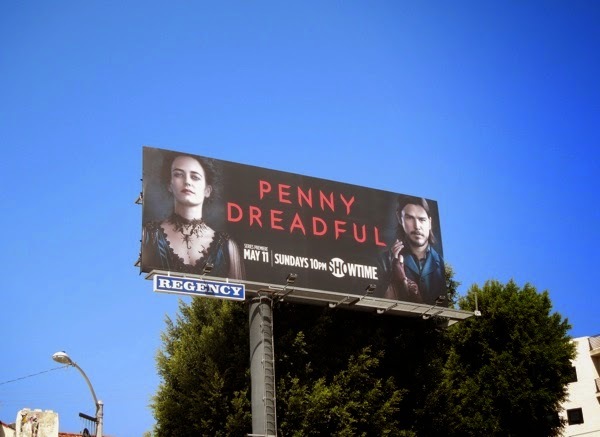 UPDATED: With as great a cast as Penny Dreadful boasts, it would be a shame not to give them their time in the spotlight don't you think. 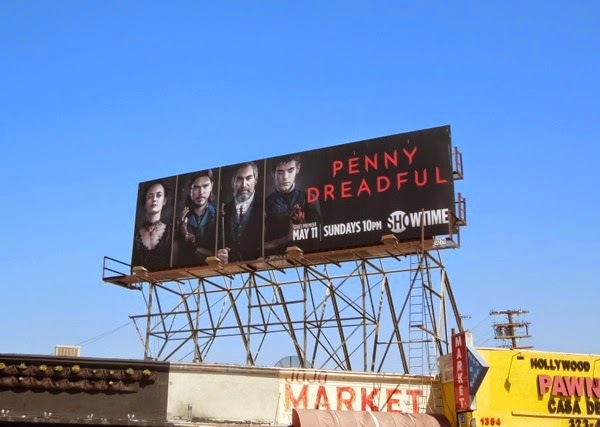 With that in mind, check out these two additional ad creatives for Showtime's new series spotted along Vine Street in Hollywood on April 29, 2014. 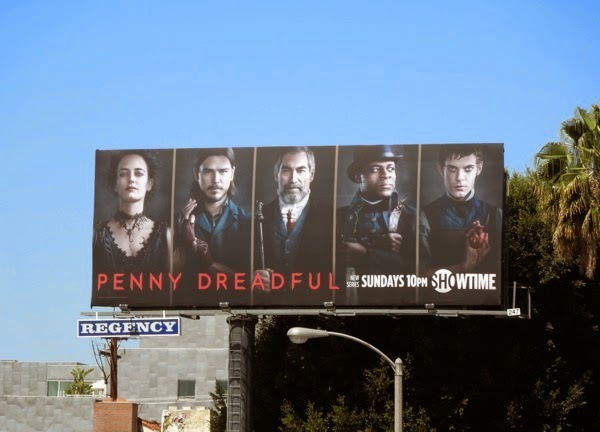 Not only do these creatives feature characters Vanessa and Ethan, but they also showcase Timothy Dalton as the explorer 'Sir Malcolm Murray', Harry Treadaway as 'Victor Frankenstein', the creator of the infamous monster, and Reeve Carney as 'Dorian Gray'. 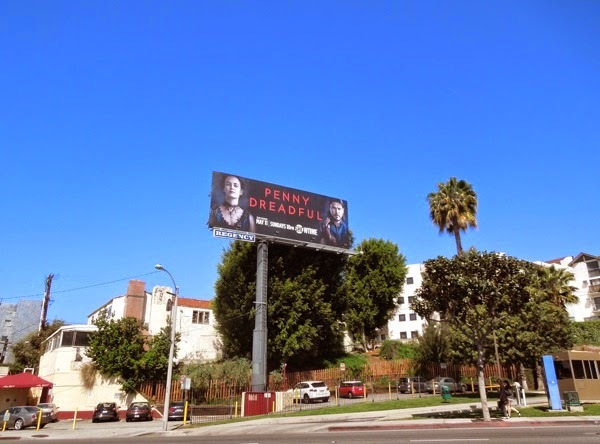 UPDATED: Following a strong debut episode, Showtime changed the billboard for Penny Dreadful along L.A.'s Sunset Strip on May 12, 2014, to introduce passersby to even more of the cast. The new ad now includes Danny Sapani as 'Sembene', Sir Malcolm's sentry and confidant with his distinctive African ritual face scarring.